Today was a milestone day – I hit the 1,000 mile mark in the village of Schonengrund, Switzerland, 3.4 kilometers east of tonight’s campground in Bachli. Only about another 700 miles of pedaling to go! A view of the Swiss countryside at the spot where I hit the 1,000 mile mark on my ride. I got lucky with the weather today. The sky this morning didn’t look promising, and there were a few sprinkles as I headed out of Lindau. But fortunately the rain held off today and I was able to make it to today’s campsite in Bachli, Switzerland without getting wet. I still had a headwind from the southwest for most of the day, but at least the temperature was cool – in the 60’s Fahrenheit – so it wasn’t too bad of a ride. Except for the hills. The first part of today’s ride was around the south end of Lake Constance (Bodensee). The lake is in a wide valley, so that part of the ride was mostly flat. But only about 5 kilometers after entering Switzerland, the real climbing began. The first of many climbs was 1,900 feet (580 meters), and today I learned to hate downhill runs because the downhills are always immediately followed by an uphill climb, and it seems like there’s always more uphill than downhill. Europeans are in some ways ahead of us in the U.S. when it comes transportation infrastructure. This electronic sign tells motorists how many parking spaces are available in various parking garages. It makes it easy for drivers to figure out the best place to park without driving around wasting gasoline. Very smart idea. Before leaving Lindau this morning I did an online search for campgrounds with Internet access, and found one in the village of Bachli. Their website listed the typical stuff for European campgrounds – showers, food store, laundry service, and so on, plus WiFi internet access. Sounded good and it was also the right distance for today’s ride, so that’s where I decided to spend the night. But when I got here the office was closed and there was only one other person in the entire campground. The food store/café was also closed, which was too bad because I was planning on eating there, so I didn’t visit a food store before arriving at the campground. So tonight’s dinner was apricots and chocolate. Since I entered Switzerland today I had to get some Swiss Francs, because Switzerland is one of the few European countries that does not use the Euro. 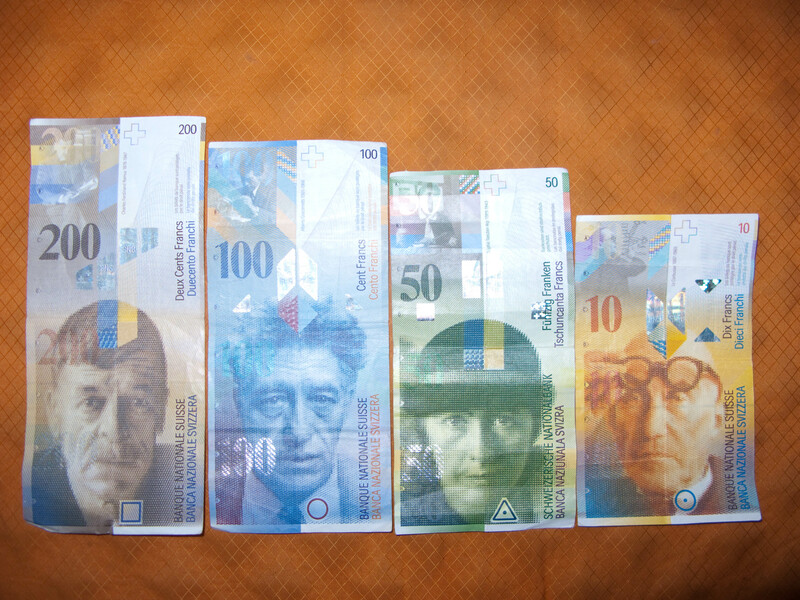 I have to say that Swiss paper money is the coolest looking of all the paper money I’ve seen so far on the trip. Very colorful with neat designs. It makes our U.S. bills look plain and dull by comparison. 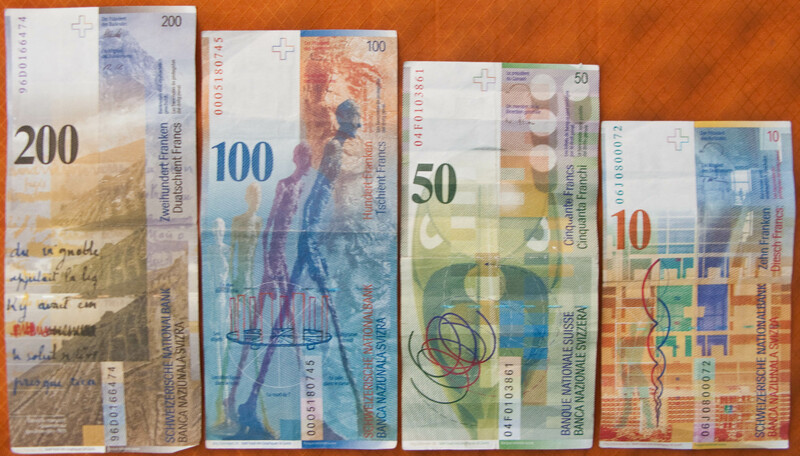 The front side of Swiss Franc bills. Click for a larger view. The back side of Swiss Franc bills. Click for a larger view. This entry was posted on August 17, 2010 at 7:56 pm and is filed under On the Road, Switzerland. You can follow any responses to this entry through the RSS 2.0 feed. You can leave a response, or trackback from your own site. I love Swiss bank notes.